Remarks Son ([sA=f n Xt=f] his son of his body) of Kaninisut [I] (owner of G 2155). Appears in chapel relief, west wall (between false doors, standing with his brother and sister in front of his parents), and north wall (standing behind his father); chapel (KHM Vienna ÄS 8006) found in situ in G 2155. Remarks Appears twice in chapel relief in tomb of Kaninisut [I] (owner of G 2155), west wall (between false doors, bottom register, sixth figure from right), and east wall (third register, butchering scene, second figure from right), identified as [sSmw] butcher; chapel (KHM Vienna ÄS 8006) found in situ in G 2155. Remarks Appears in chapel relief in tomb of Kaninisut [I] (owner of G 2155), west wall (between false doors, middle register of ka-priests, third figure from right, carrying crane), identified as [Hm-kA] ka-priest; chapel (KHM Vienna ÄS 8006) found in situ in G 2155. Remarks Appears in chapel relief in tomb of Kaninisut [I] (owner of G 2155), west wall (between false doors, middle register of ka-priests, fifth figure from right, carrying goose), identified as [Hm-kA] ka-priest; chapel (KHM Vienna ÄS 8006) found in situ in G 2155. Remarks Appears in chapel relief in tomb of Kaninisut [I] (owner of G 2155), west wall (between false doors, top register of scribes, second figure from right), identified as [sS] scribe; chapel (KHM Vienna ÄS 8006) found in situ in G 2155. Remarks Appears twice in chapel relief in tomb of Kaninisut [I] (owner of G 2155), west wall (between false doors, bottom register, second figure from right), and east wall (bottom register, second figure from right), identified as [wdpw] butler; chapel (KHM Vienna ÄS 8006) found in situ in G 2155. Remarks Appears in chapel relief in tomb of Kaninisut [I] (owner of G 2155), west wall (between false doors, bottom register, eighth figure from right), identified as [Hm-kA] ka-priest; chapel (KHM Vienna ÄS 8006) found in situ in G 2155. Remarks Appears in chapel relief in tomb of Kaninisut [I] (owner of G 2155), west wall (between false doors, middle register of ka-priests, fourth figure from right), identified as [Hm-kA] ka-priest; chapel (KHM Vienna ÄS 8006) found in situ in G 2155. Remarks Appears in chapel relief in tomb of Kaninisut [I] (owner of G 2155), west wall (between false doors, bottom register, ninth figure from right, name only partially preserved), identified as [Hm-kA] ka-priest; chapel (KHM Vienna ÄS 8006) found in situ in G 2155. Remarks Appears in chapel relief in tomb of Kaninisut [I] (owner of G 2155), west wall (between false doors, bottom register, third figure from right), identified as [xrp sH] director of the dining hall; chapel (KHM Vienna ÄS 8006) found in situ in G 2155. One of two figures named Mernetjerukhufu (other on east wall, bottom register, eleventh figure from right); possibly same individual. Remarks Appears in chapel relief in tomb of Kaninisut [I] (owner of G 2155), west wall (between false doors, top register of scribes, third figure from right), identified as [sS] scribe; chapel (KHM Vienna ÄS 8006) found in situ in G 2155. Remarks Appears twice in chapel relief in tomb of Kaninisut [I] (owner of G 2155), west wall (between false doors, bottom register, first figure on right), and east wall (bottom register, third figure from right), identified as [wdpw] butler; chapel (KHM Vienna ÄS 8006) found in situ in G 2155. One of two individuals named Niankhhathor (other on south wall of chapel entrance passage, third figure from right); possibly same individual. Remarks Appears three times in chapel relief in tomb of Kaninisut [I] (owner of G 2155), north false door (south jamb), west wall (between false doors, middle register of ka-priests, first figure on right), identified as [Hm-kA] ka-priest (on west wall), and east wall (over chapel entrance, top register, stern of boat); chapel (KHM Vienna ÄS 8006) found in situ in G 2155. Remarks Appears twice in chapel relief in tomb of Kaninisut [I] (owner of G 2155), west wall (between false doors, bottom register, fifth figure from right), and east wall (bottom register, fifth figure from right), identified as [wdpw] butler; chapel (KHM Vienna ÄS 8006) found in situ in G 2155. Remarks Appears in chapel relief in tomb of Kaninisut [I] (owner of G 2155), west wall (between false doors, bottom register, tenth figure from right), identified as [Hm-kA] ka-priest; chapel (KHM Vienna ÄS 8006) found in situ in G 2155. Remarks Appears in chapel relief in tomb of Kaninisut [I] (owner of G 2155), west wall (between false doors, bottom register, fourth figure from right), identified as [jmj-r sSr] overseer of linen; chapel (KHM Vienna ÄS 8006) found in situ in G 2155. One of two figures named Seshmu (other on east wall, third register, butchering scene, fourth figure from right); may be same individual. Remarks Appears in chapel relief in tomb of Kaninisut [I] (owner of G 2155), west wall (between false doors, bottom register, seventh figure from right), identified as [Hm-kA] ka-priest; chapel (KHM Vienna ÄS 8006) found in situ in G 2155. Remarks Appears twice in chapel relief in tomb of Kaninisut [I] (owner of G 2155), west wall (between false doors, top register of scribes, fourth figure from right), identified as [sS] scribe, and north wall (middle register, third figure from left), identified as [jrj-mDAt] letter carrier; chapel (KHM Vienna ÄS 8006) found in situ in G 2155. 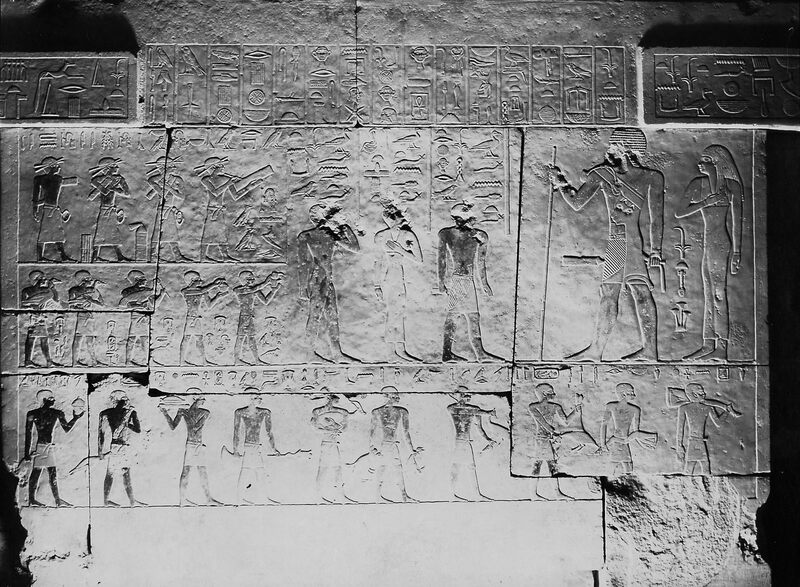 Two of four figures named Tjenti (two assumed to be same individual; others on east wall, bottom register, first and seventh figures from right). Remarks Daughter ([sAt=f n Xt=f] his daughter of his body) of Kaninisut [I] (owner of G 2155). Appears in chapel relief, west wall (between false doors, standing with her brothers in front of her parents); chapel (KHM Vienna ÄS 8006) found in situ in G 2155. Remarks Owner of D 117. Chapel entrance lintel and drum lintel and south false door inscribed for Wehemka; also appears in chapel relief (west, north, south, east walls); identified variously as [rx nswt sS pr-mDAt sS nfrw jmj-r pr] royal acquaintance, scribe of the library, scribe of recruits, steward; chapel (Hildesheim 2970) found in situ in D 117. Also appears three times in chapel relief of tomb of Kaninisut [I] (owner of G 2155), twice on west wall (panel of relief south of south false door, top register; between false doors, top register of scribes, first figure on right), and north wall (top register, first figure on left), identified as [sS pr-mDAt] scribe of the library (on panel of relief south of south false door) and [jmj-r pr] steward (on north and west walls); chapel (KHM Vienna ÄS 8006) found in situ in G 2155.